Religious discrimination is valuing or treating a person or group differently because of what they do or do not believe. Specifically, it is when adherents of different religions (or denominations) are treated unequally, either before the law or in institutional settings such as employment or housing. Even in societies where freedom of religion is a constitutional right, sometimes adherents of religious minorities voice concerns about religious discrimination against them. 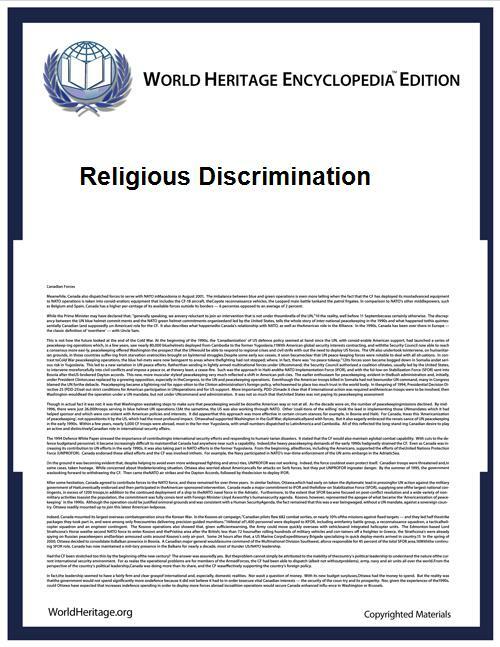 Insofar as legal policies are concerned, cases that are perceived as religious discrimination might be the result of an interference of the religious sphere with other spheres of the public that are regulated by law (and not aimed specifically against a religious minority). In Quebec has used two school systems, one Protestant and the other Roman Catholic, but it seems this system will be replaced with two secular school systems: one French and the other English. Canadian faith based university, Trinity Western University is currently facing a challenge from members of the legal and LGBT community to its freedom to educate students in a private university context while holding certain religious values. TWU faced a similar battle in 2001 (Trinity Western University v. British Columbia College of Teachers) where the Supreme Court of Canada ruled that TWU was capable to teach professional disciplines. Recently, professor Nick Drydakis (Anglia Ruskin University), examined religious affiliation and employment bias in Athens, by implementing an experimental field study. Labor market outcomes (occupation access, entry wage, and wait time for call back) were assessed for three religious minorities (Pentecostal, evangelical, and Jehovah's Witnesses). Results indicate that religious minorities experience employment bias Moreover, religious minorities face greater constraints on occupational access in more prestigious jobs compared to less prestigious jobs. Occupational access and entry wage bias is highest for religious minority women. In all cases, Jehovah's Witnesses face the greatest bias; female employers offered significantly lower entry wages to Jehovah's Witnesses than male employers. Syria. Although Turkey's support for ISIS can't be proven, in one instance they opened their border and allowed Al Nusra terrorists, a radical Islamic group that controls land in Syria, to enter through their border, and then into the majority Armenian Christian town of Kessab(which is right on the Turkish–Syrian border)—Al Nusra raided the whole town, and took those who didn't flee as prisoners with them to the Turkish city of Iskenderun. ^ Challenges to TWU law school application. ^ The requested URL /articles/other/mexico.shtml was not found on this server.